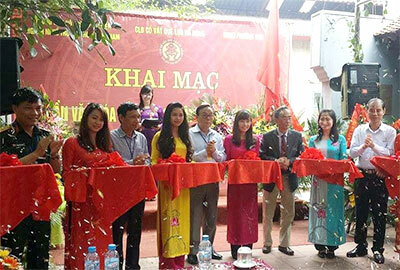 On April 24th, a silk cultural festival took place in Van Phuc silk village, Ha Dong district, Ha Noi to mark the 40th anniversary of southern liberation and national unification (April 30th) and the 125th anniversary of President Ho Chi Minh’s birth (May 19th). A range of activities will take place during the festival between April 24th and May 1st including a display of Orchids at handicraft place of Van Phuc traditional village; an antique preservation cultural exchange at Bach Dang cultural house; an art performance on April 24th at Van Phuc pagoda; sports activities at clubs and residential areas; a professional dog performance on April 25th at Bach Dang cultural house; and a bird contest at Bach Dang cultural house on April 26th. The antique preservation cultural exchange introduced ancient artifacts, drawing the participation of local people and visitors.